Root canal therapy, also known as endodontics, is required when the pulp or nerve at the centre of a tooth becomes infected or dies over time. There can be many reasons for this, for example deep fillings or trauma to the teeth, such as sports injuries. The treatment is carried out under local anaesthetic or sedation so is completely pain-free. Despite people’s experiences, our dentists are highly-trained to provide root canal therapy completely painlessly. It is also essential for infected teeth because, without it, you could lose your tooth. Our principal dentist, Dr Jazz Battu, can carry out simple and complex root canal treatments, including repeat treatments. We also offer a referral service for complex root canal work, taking on cases from other dentists across Essex and London. Our dentists are careful to explain all aspects of treatment to patients so that they can make informed decisions regarding their treatment. There are three or four different root canal therapy options, so we will present you with all of the options and after discussion will make sure we carry out the right treatment for you. Standard root canal treatment involves the thorough cleaning of the root canals of infected teeth using special endodontic equipment. The tooth will then be filled and sealed to prevent infection recurring. 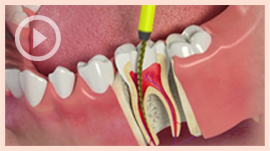 In some cases it is recommended to strengthen a root canal treated tooth with a crown. Root canal therapy is a skilled and delicate procedure, and the length of your appointment will vary depending on which tooth is infected. Typically, front teeth have one root with a single root canal, whilst back teeth can have two or three roots with a couple of root canals each. Treatment is carried out under local anaesthetic or sedation and should feel no more traumatic than having a filling. You may need two appointments, to ensure that the infection has cleared fully before filling the tooth. Your tooth will be temporarily filled during treatment. Patients referred to us from other dentists will be sent back to their referring dentist when treatment is complete.